The Highlands are a series of parallel ridges running in a northeast/southwest direction. This area drains 489 square miles of watershed. Most major tributaries of the Passaic River drain from the Highlands. These are the Whippany, Rockaway, Pequannock, Wanaque, Ramapo, and Pompton Rivers. These waterways and their tributaries are characterized by flash floods; the valleys are narrow and steep sided. Development in this area has been limited, compared to the other two regions, due to the topography. Flooding, however, is a common occurrence in established towns. For example, Morristown, on the Whippany River, and Denville and Dover on the Rockaway River are representative municipalities in the Highlands that have had major flood damages. The Central Basin is comprised of large areas of meadows and swamps. At least 27, 000 acres of freshwater wetlands still exist in the Central Basin. It is a broad and relatively flat valley that extends from Long Hill Township in the south, to Pequannock Township in the north. Flooding has occurred primarily in Wayne, Lincoln Park, Pequannock, Pompton Lakes, and Fairfield. The flood plain of the Passaic River ranges from 5,000 to 20,000 feet in width throughout much of the Central Basin, narrowing to approximately 100 to 4,000 feet at Chatham Borough. The Lower Valley extends from Little Falls to Newark Bay. It is 173 square miles in size. The Lower Valley is fairly flat and the flow of the Passaic River is quite slow as it broadens out and empties into Newark Bay. The Lower Valley is the most extensively developed area of the watershed, including cities such as Paterson, Passaic and Newark, where the waterfronts are nearly entirely developed and public access is limited. The Wisconsin glacier, or ice sheet, started its southern movement about 50,000 years ago. This is a relatively short time geologically when you consider that the red shale that the Central Basin of the Passaic River rests upon was laid down as a sediment about 185,000,000 years ago during Triassic Time and that the trap ridges or Watchung Mountains boiled out of the earth as molten lava and solidified about 175,000,000 years ago, also during Triassic Time. The Wisconsin ice sheet reached the Paterson-Little Falls approximately 15,000 years ago and continued on to its terminal moraine, or most southern position, reaching it about 3,000 years later or about 12,000 years ago. As the ice sheet melted and started to retreat back towards Paterson again, the progress was much faster, taking only about 1,000 years. So Lake Passaic, as such, ceased being about 11,000 years ago. This was followed by post-glacial lakes. Even today we have The Great Piece Meadows, Hatfield Swamp and The Great Swamp as relatively shallow remains of the past. When the Wisconsin ice sheet, or glacier, reached the gaps at Paterson and Little Falls and sealed them off, any drainage in front of the ice accumulated as a lake. Any lake formed would be very small and shallow since the overflow was over the low divide separating the drainage basin which may have had its outlet at Little Falls from that which had its outlet through the Short Hills gap. As the glacier retreated, it plugged the pre-glacial outlet at Short Hills with drift and Moggy Hollow remained the outlet of the lake. The lake grew in size as the ice retreated and at its maximum size, Lake Passaic was about 30 miles long, 8 to 10 miles wide, 240 feet deep at its maximum and 160 to 200 feet deep over wide areas. When the glacier retreated north to the Paterson-Little Falls gaps, they were opened, and the lake drained through them, thus ending the overflow through Moggy Hollow. In the years necessary for the water to wear down the hard rocks in the gaps to their present level, there were post-glacial lakes in the basin. The longest lived of these was the one that occupied the area of The Great Swamp northwest of Long Hill, which lasted while the overflow was cutting the narrow gorge at Millington. The elevation of this lake at the outset was about 320 feet above the sea but as the outlet was slowly cut down to its present level of 221 feet, the lake was drained. 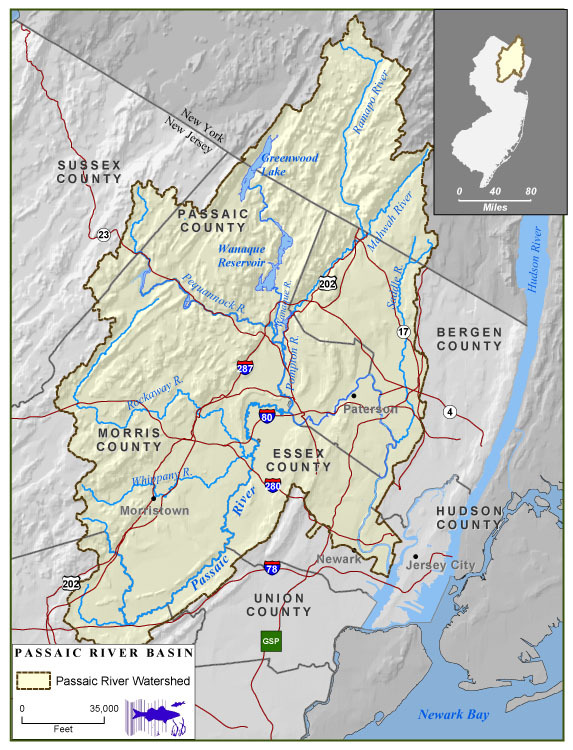 The Passaic River Basin has been recognized by hydrologic experts as one of the most flood-prone river systems in the United States. Since 1870, governments have tried to devise plans to control this river. Prior to 1902, flood control for the Passaic River Basin was limited to ditching local swamps and desnagging and enlarging sections of the Passaic River’s channel. For the period from 1902 through 1936, the State of New Jersey established Flood District Comm. to formulate plans to alleviate the flooding. Recommendations included the construction of dams and reservoirs, channel enlargements, dry detention basins, flood gates, and a “tunnel.” Although there were at least five major floods during this time period, each project was deemed too expensive, inadequate, or inadvisable. None were implemented. In 1936, Congress authorized the U.S. Army Corps of Engineers (Corps) to conduct a survey of the Passaic River Basin for flood control in response to the worst winter flood since 1902. This flood was the result of a 6 inch rainfall and a 5 inch snowmelt over an eight day period, peaking twice, eight days apart. Channel enlargements were recommended by the Passaic River Valley Flood Control Comm., while the Corps results were still pending. In 1939, the first Corps plan was presented. It combined dry detention basins and channel improvements. This plan was abandoned due to the onset of World War II. In 1945, a severe flood swept through the Basin, and the Corps renewed its study. The next plan replaced the dry basin plan with a dual-purpose reservoir. This plan met with opposition from landowners. Continued flooding prompted then New Jersey Governor Alfred E. Driscoll to appoint the Passaic Valley Flood Control Committee. In 1955, after three years of study, the Committee presented several alternatives included utilizing natural storage areas, prevention of further encroachment on the flood plain, clearing the flood plain, protecting industrial areas with walls and dikes, and stream and river desnagging. These findings were submitted to the Corps. In 1956, the Corps presented a new plan for reservoir and detention areas, channel widening, stricter flood plain zoning, and a 7-mile long tunnel. Lacking support, the plans were returned for revision, with the direction to include water conservation measures. At the time, New Jersey was experiencing a 4-year drought. As encroachments and filling of riparian wetlands continued unchecked, and local populations increased, so did the frequency and severity of flooding events. The Corps, responding to a new urgency, presented four alternatives in the 1968 document known as the Passaic River Basin Water Resources Bulletin. Their recommended plan (Plan III) called for the construction of two large dams and reservoirs, received partial support from the public and was endorsed by then Governor Richard Hughes, in 1969. Severe storms and floods continued to wreak havoc in the basin, keeping the issue in the press. In 1973, after a review by the Board of Engineers for Rivers and Harbors in Washington D.C., several problems were outlined, both economic and environmental, and an alternative was proposed (Plan II B) which also included dams, a reservoir, and a dry detention basin. Public opinion was divided, but the plan was approved by then Governor Brendan Byrne. In 1976, hearings of the House Public Works Subcommittee on Water Resources ordered several restrictions on the Plan, the first of which required that a full range of non-structural flood control alternatives be considered. To be included in the plan were land acquisition, flood plain mapping, flood proofing, early waning systems, and relocation of structures. Also suggested for secondary consideration were a tunnel or system of tunnels, local improvements to stream capacities, combining water supply objectives with flood control objectives, groundwater and aquifer issues, and existing reservoir management. A new study was begun in 1977 to alleviate the $85 million dollars average annual damages from flooding. After evaluating the economic, environmental, and social issues, the Sate of New Jersey, in 1984, selected a modified Corps preferred alternative: The Pompton/Passaic Dual Inlet Tunnel Diversion Plan. The original design, which proposed a 13.5 mile flood tunnel that would outlet at the Clifton/Nutley border, was rejected. The major elements of the project were the 40 foot diameter, 20.1 mile long tunnel, a 22-foot diameter, 1.2 mile long spur tunnel, two inlets, one outlet, at least four workshafts along the tunnel pathway, “natural” storage areas, channel modifications, ponding areas, levees, and flood walls. The outlet of the tunnel would be located in Newark Bay, 1,500 feet south of Kearny Point. The 20.1-mile long main tunnel would carry flood waters from an inlet at the confluence of the Pequannock, Wanaque, Ramapo, and Pompton Rivers, The 1.2-mile long spur would carry floodwaters from the Passaic River, downstream from Two Bridges, to a connection with the main tunnel beneath the borough of Totowa. The Foodwarning and Forecasting System would be pressed into service to establish operating signals for the tunnel. Most of the major channel modifications occur near the two inlets. They will modify several portions of the Passaic, Pompton, Ramapo, Wanaque, and Pequannock Rivers. There are also two interim projects slated to be constructed prior to the construction of the diversion tunnel. These two projects include major stream alterations, including channelization to the Saddle River and Ramapo River. Loss of water quality – affecting human health and recreation, and affecting biotic ecosystems. Loss of wildlife habitat – while mitigation would replace lost wetlands, there is no guarantee wildlife will migrate to new areas, and in the case of non-migratory species, there would be no assurance of their survival once habitat has been destroyed. Loss of water quality – groundwater recharge would be severely curtailed by the removal of millions of cubic feet of water from recharge areas. Loss of recreational opportunities and access – loss of public parklands and access areas will be “taken” for ponding and retention areas. Riverfront access will be impeded by levees, dikes, and floodwalls. In September 1995, the Corps issued another series of reports on the flood tunnel and their version of a buyout.